Do you know who sank the boat? 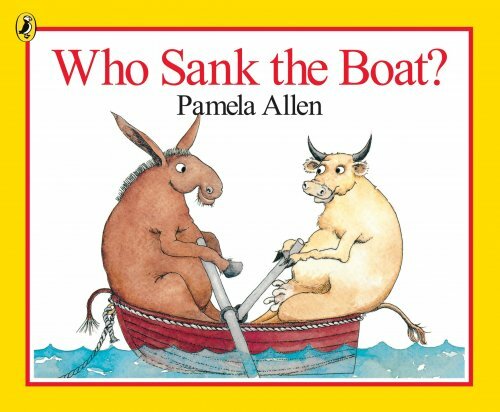 A charming book about a cow, a donkey, a pig, a sheep and a tiny little mouse who all get into a rowboat. But, as the title suggests, something goes wrong and the boat sinks. Children love the suspense of watching the boat get fuller and fuller while making predictions about which animal will sink the boat. The simple narrative structure makes it a great choice when working on the narrative retells of younger children. Children love to recreate the story using plastic toys or even dressing up as the animals. Although not explicitly mentioned in the text, this book can be used to teach concepts such as heavy/light, empty/full, and float/sink. It is widely used in schools to teach measurement and weight. This short, repetitive, rhyming text is a fantastic choice to target many speech and language goals. See the list below for more information.